On January 1st, 2010 we have been advised by a collector client traveling in India that GODDESS LAKSHMI is available for sale in Mumbai at 750,000 Rupees or $16,300.00 USD. 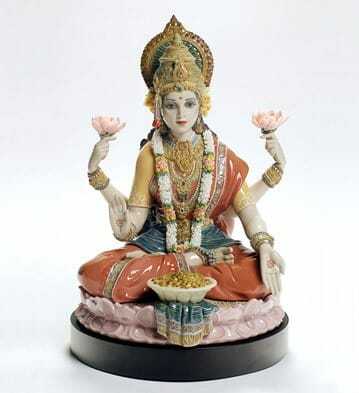 She is goddess of wealth, fortune, power, luxury, beauty, fertility and auspiciousness. This sculpture was first launched in July 2007 with a 3-month exclusvie to India. GODDESS LAKSHMI is meant to go along with the Limited Edition LORD GANESHA of 2002 and RADHA KRISHNA of 2005. In Hindu mythology, these pieces are most appropriately to be placed together.